To respond to the increasing need to feed the world's population as well as an ever greater demand for a balanced and healthy diet there is a continuing need to produce improved new cultivars or varieties of plants, particularly crop plants. The strategies used to produce these are increasingly based on our knowledge of relevant science, particularly genetics, but involves a multidisciplinary understanding that optimizes the approaches taken. 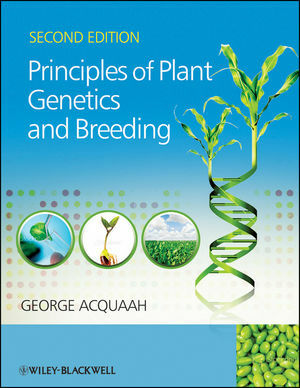 Principles of Plant Genetics and Breeding, 2nd Edition introduces both classical and molecular tools for plant breeding. Topics such as biotechnology in plant breeding, intellectual property, risks, emerging concepts (decentralized breeding, organic breeding), and more are addressed in the new, updated edition of this text. Industry highlight boxes are included throughout the text to contextualize the information given through the professional experiences of plant breeders. The final chapters provide a useful reference on breeding the largest and most common crops. George Acquaah is Dean at Bowie State University. He is the author of four critically acclaimed textbooks, and has received numerous awards, including the prestigious USDA Award for Excellence in College and University Teaching in Food and Agricultural Sciences, and the Millennium Award for Excellence in Teaching, presented by the White House Initiative on Historically Black Colleges and Universities in the US. The book is accompanied by a companion resources site: www.wiley.com/go/acquaah/plantgeneticsandbreeding With figures and tables from the book.